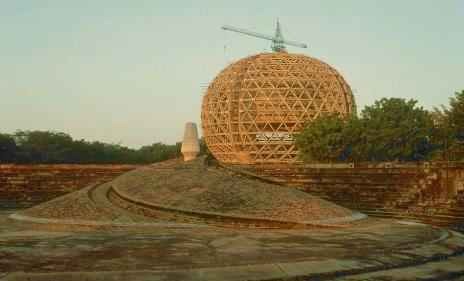 The Matrimandir will be the soul of Auroville. -- The Mother. The Matrimandir (under construction) as seen from the Amphitheatre, with the inauguration ceremony urn in the foreground. For a visual tour of the building of the Matrimandir, follow this link. See also the Matrimandir page on the Auroville site. The Matrimandir is both the physical and spiritual center of Auroville. Matrimandir, in Sanskrit, means "Temple of the Divine Mother". Its inner chamber is meant to be a place for quiet and concentration, void of any ritual, where anyone can sit to meditate in silence. Physically, the Matrimandir is a 100-foot-high elliptical sphere resting on four pillars sunk deep into its foundation. Each pillar represents an aspect of the Divine Mother: Wisdom, Strength, Harmony, Perfection. The Matrimandir will be surrounded by a network of 12 gardens and a lake. Inside the upper portion of the Matrimandir is the inner chamber, a 12-sided room whose walls are lined with white Italian marble. At the center is a sphere of pure crystal, 70 cm. in diameter, illuminated by sun light channeled from an opening at the top of the chamber. Built with the support of people from all over the world, Matrimandir stands as a living example of human unity in diversity which Auroville seeks to express and manifest a unity essential for our planet's survival.